2016 has become very productive for RETAL. Upon receiving the DANONE international awards as well as success at “BRAU Beviale” and “ALL4PACK” international trade fairs, the company won Business Heavyweights award at Plastics of Russia, the 9th annual industry forum for the second time. Plastics of Russia forum is an annual meeting held in Moscow to bring the key players of the plastics market in CIS together. Apart from exchanging experience, forum organizers prioritize the process of rewarding dynamically developing companies that identify their excellence in contributing to the growth of industry’s strategic framework. In this respect, RETAL gained its recognition. RETAL wins this prestigious award not for the first time. In 2013, the company gained Business Heavyweights award due to the impact of activities regarding the employment, cash flows, several social and environmental projects implemented. 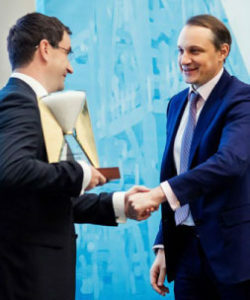 In two years, RETAL appeared among the awarded recipients again. This year the suppliers and leading manufacturers of basic polymers selected the top plastics companies that met the requirements of the market. They gave their preference to RETAL as the leading PET recycling company in the nominated segment, called PET Recycling. 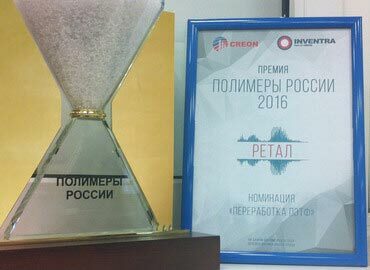 Innovative projects in packaging field, implemented by RETAL this year, received a special attention.